Celebrate Valentine’s Day with a new social networking site! 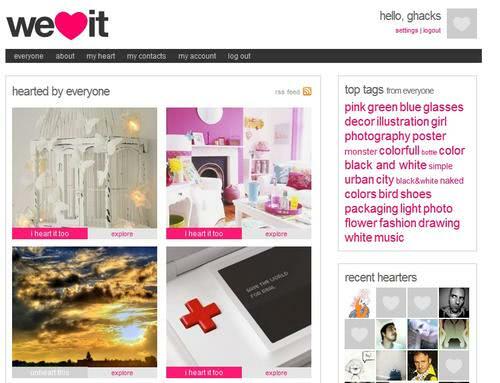 We Heart It is an image-based social network that hasn’t attracted much attention until recently. It started in 2011, but with its first press release in June 2013, We Heart It announced that it had gained over 20 million users with no money spent on marketing [information source]. As a fast-growing site for females aged 24 and under (which makes up 80% of its users) [information source], We Heart It is a social media site to keep an eye on for its mega-potential to tap into a market that is consistently younger than the market reached on Pinterest. Some of We Heart It’s appeal is that it is still new enough to be “cool” to younger users. While websites and apps like Facebook and Pinterest have become widespread and are used heavily by the over-24 demographic, We Heart It still feels fresh, a place users can go to find inspiration and self-expression without seeing their parents following their content. Users can view images from people they follow or users can search popular tags. When users see an image they like, they simply click the heart in the middle of the picture to “heart” it. “Hearted” pictures are added to the user’s personal canvas. Users can organize similar images from their canvas into customized collections. Users can post and tag their own content to share with followers and search lists. To make hearting online easy, users can download the We Heart It button in the toolbar: a “cute” pink heart button that undoubtedly appeals to the main user demographic. In many ways, We Heart It feels like a younger version of Pinterest. Similar to the Pinterest boards, We Heart It users create collections filled with related images. Unlike Pinterest, We Heart It images are not linked to a website. For many users, this gives We Heart It a more genuine feel, as the site (at the moment) comes across less as an avenue for marketing and more as an avenue for personal inspiration and sharing. That’s not to say that We Heart It won’t be used for social media marketing. Right now, advertising is available on the site in a way that doesn’t overpower: Ads show up as another picture in the image feeds. However, the personal tone of We Heart It doesn’t mean that using it to market a product won’t be powerful, especially if it suits the needs of a younger female target market. Want to sell a new nail polish, promote a new band, or tap into what’s trending in this market? Posting good images on We Heart It definitely has potential to monetize the social network for businesses. With a young demographic to think about, We Heart It has also designed the site with cyberbullying in mind. We Heart It doesn’t have a comments feature on pictures but only a tag feature. Much like the hashtag on Instagram, tags can be used to label content and search for similar content, but eliminating a comments section helps avoid the negativity that can follow younger users. For now, We Heart It is booming, adding about 1 million users per month with about 80% of its activity going to mobile devices [information source]. The site, though, is still at a time when you can join and be an early user, among the first to gain expertise in a new social media platform.